It does not sting, but calms and nurtures the sensitive areas of the skin. The spray can be applied comfortably on the irritated shaved (intimate) parts of the body and be spread easily. It has a relaxing effect and provides soothing support for your regular beauty treatment. The hairless skin feels silky smooth and the stress is nowhere to be seen. So you can feel comfortable in your own skin again! 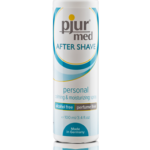 pjur med After Shave spray is made for that special aftercare.